After a long hiatus, we are finally reviewing another root beer! Mason’s root beer is “keg barrel flavor”, as evidenced by the keg on the bottle. It comes in an interesting amber-colored glass bottle, and is bottled by the Real Soda company. The ingredients listed are vague, with Carbonated water, sugar, caramel color, sodium benzoate (a preservative), citric acid, natural and artificial flavors. While this isn’t the most outstanding root beer on the market, it is nowhere near the worst either. 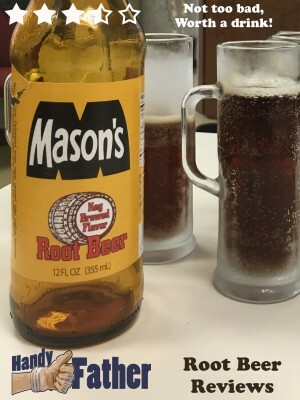 Mason’s root beer must have a complex flavor, or we are out of practice in tasting subtle nuances due to our lack of recent reviews. We give our Mason’s Root Beer Review a score of 3.5 out of 5 stars for its creamy, and satisfying root beer flavor. I was unable to find any Mason’s root beer for sale online, but this sign is available on Amazon. Neat!